Breakfast, the first meal of the day! If I had a choice, I would most likely have smoothies every day…I love em, but unfortunately in the van it’s not always possible. As our blender stick uses more watts than our inverter can handle, we only get to enjoy our smoothies when we are plugged in to a powered site….or we happen to find a sneaky power point in a park somewhere. Enter overnight oats. This is a super simple recipe that is prepared the night before – just wake up and eat! 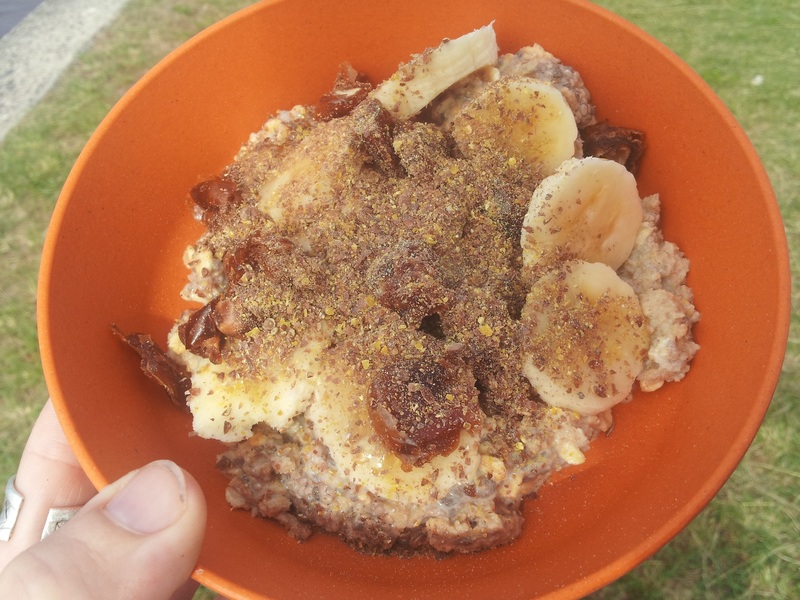 Place oats, chia seeds and seeds/nuts (if using) in a medium sized bowl. Add cinnamon and stevia and stir through. Cover with milk – you may not need the full two cups, just make sure there’s enough to cover all the dry ingredients. The amount you put in will obviously result in a thicker or more liquid-y brekky. Add vanilla and stir well to combine. Cover and refrigerate over night. In the morning, top with your favourite fruits and/or nuts. Some of our favourite combos are banana, strawberry and passionfruit; banana, dates, agave and flax meal; and strawberry/kiwi fruit. And it’s as simple as that! So easy, yet so yummy.